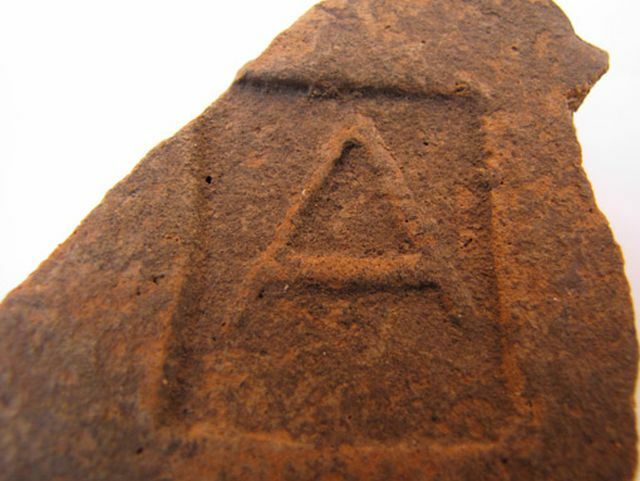 Bulgarian and French archaeologists excavating an ancient suburban estate and necropolis, which were part of the Ancient Greek colony of Apollonia Pontica (today’s Sozopol) on the Black Sea coast, have discovered six ancient funerals as well as unique roof tiles with stamps which appear to have been dedicated to god Apollo. The archaeological excavations in the area known as “Misarite" near Sozopol are led by Assoc. Prof. Dr. Krastina Panayotova from the National Institute and Museum of Archaeology of the Bulgarian Academy of Sciences and Dr. Alexandre Baralis from the Department of Ancient Greek, Etruscan, and Roman Antiquities in the Louvre Museum in Paris, France. The suburban estate, which existed in the 5th-3rd century BC, is located to the southwest of the Ancient Greek colony of Apollonia Pontica, today’s Sozopol. It has been excavated by the Bulgarian-French expedition for the past three years. 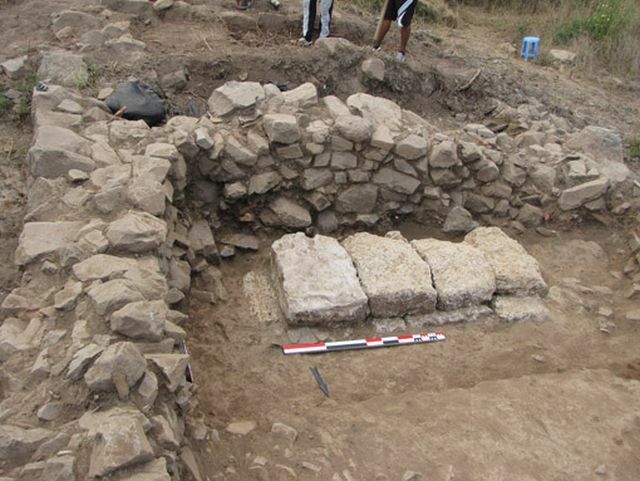 During their 2015 summer excavations so far, the Bulgarian and French archaeologists have unearthed the ruins of three buildings first inhabited around the middle of the 5th century BC, which saw their height at the end of the 4th century BC, reports local news site Chernomorie BG. The buildings were built with stone masonry, and were covered with roof tiles stamped with the letter A, i.e. the Greek letter alpha. 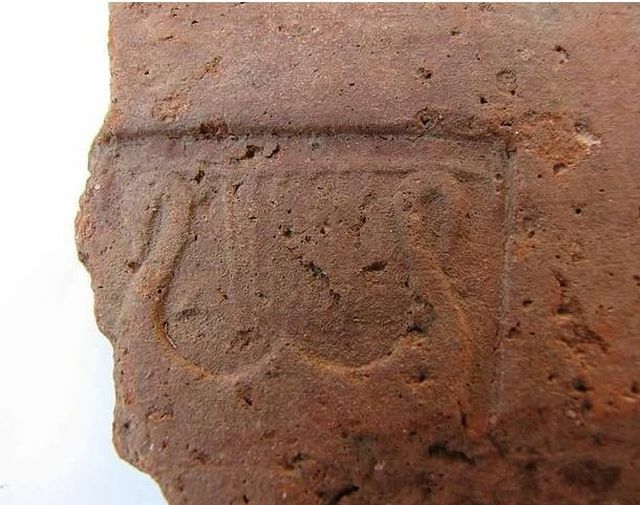 An extremely interesting find which has just been discovered is a roof tile stamped with the image of a guitar. Not unlike the letter A, the guitar image is connected with the cult for Ancient Greek god Apollo after whom the colony of Apollonia Pontica (Sozopol) was named. “The “stamped" roof tile we have stumbled upon is really precious, indeed. This is the second time a guitar image stamp has been found in Sozopol. We don’t know of a similar discovery elsewhere… Apollonia Pontica was named after god Apollo, and it is logical that his emblem will be all over the place. It is interesting that according to the mythology Apollo played the guitar. This is evidenced by a lot of coins with the image of a guitar so this [find] is no accidence," says Bulgarian archaeologist Kristina Panayotova, as cited by local news site StrandjaNews. She explains that in addition to the roof tile with the guitar stamp she and her colleagues have found a total of 26 roof tiles with the image of the letter A (alpha) at the ancient suburban estate near Sozopol. Of those, 15 have been found during the 2015 digs, and the other 11 were found last year. “This high number leads us to believe that this was an ancient workshop producing stamps with the emblem of Apollo," Panayotova explains. Inside the ruins of one of the three newly researched ancient buildings, the archaeologists have discovered a total of six graves (for a total of eight when counting the funerals discovered last year). One of those has been found in a pithos (a large ceramic vessel), another one – in a limestone enclosure, and the other four – in ceramic urns with traces of cremation. In one of urns, the archaeologists have found the remains of three people. The funeral inventory discovered in the necropolis consists of artifacts such as vessels, coins, and a funeral wreath. The Bulgarian and French archaeologists will continue working on the suburban estate from the Ancient Greek colony Apollonia Pontica until the end of August 2015. The Bulgarian Black Sea resort town of Sozopol is very rich in terms of archaeology and historical heritage. Another major archaeological site in its region is the St. Ivan (St. John) Island right off the Black Sea coast where an Early Christian tomb has recently been found.